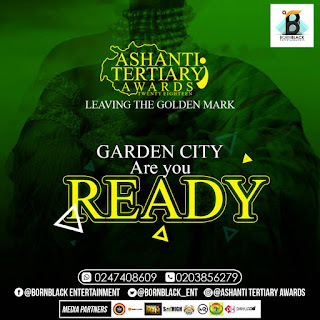 The Maiden Edition of Ashanti Tertiary Awards 2018 is a program designed to award and honour hardworking tertiary students in Ashanti Region. Students in all Universities, Colleges, Nursing Trainings, Teacher Training, various Media and Fashion Schools, in the Ashanti Region qualify to partake in this award show. This great program seeks to award students on the fields of academics, music, arts, media, entertainment, and fashion, in all tertiary schools in Ashanti Region. Ashanti Tertiary Awards will be launch at Kwame Nkrumah University of Science and Technology campus on 9th March 2018 at 7pm, and there will be an after party at Vienna City Kumasi. The program will be graced by Bornblack Entertainment and various Student Representative Councils (SRCs) across Ashanti Region.